With a closet stocked with well-chosen staples, dressing is nearly effortless. That’s why we’ve compiled this list of basics, to make sure you’re stylish from head to toe. Loafers. Get a pair each in black and brown leather and you’ll have shoes that coordinate with just about any outfit. Custom suit. If you currently plan on only one custom suit, a dark color will give you the most mix-and-match possibilities. A v-neck sweater. This layering option ensures you’ll be comfortable as temperatures change. Custom dress shirts. 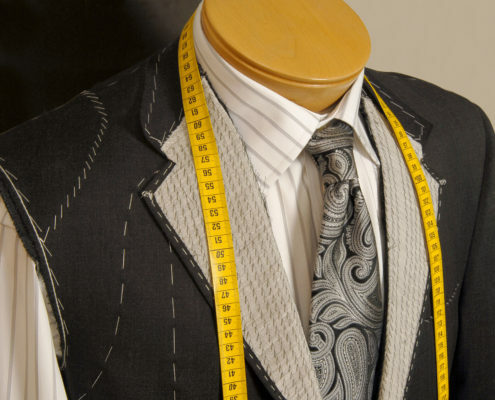 A fantastic, custom-fit suit deserves several excellent custom shirts. Start with white or blue shirts, and then add in other solid colors and stripes to your taste. A blazer. Traditional navy is always a great option for your custom blazer, but depending on your preferences and the colors you wear most frequently, tan or gray can also be great options for this foundational piece. Khaki trousers. This is the quintessential “business casual” color, but gray or navy can serve equally well. Custom sport (or casual) shirts. Creating custom-fit sport shirts means your casual attire has the same great fit and feel as your business wardrobe. When you purchase off-the-rack clothing, you have to search almost endlessly for each piece that will work in your wardrobe. With custom clothing, your private appointment with your personal clothier lets you design just the look you want, for a wide range of items. We can design your jackets, trousers, shirts, ties, pocket squares, and more-all in one exclusive appointment. Enjoy our undivided attention and personalized advice while perusing the latest exquisite fabrics. Our goal is to make the experience of designing your wardrobe just as pleasant and comfortable as wearing custom-tailored clothing is.